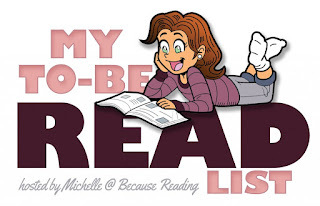 Musings of a Bookish Kitty: My August TBR List Poll Winner! It was a tight race this week. I had a three way tie up until Friday night, when I sent out a plea for a tie breaker. 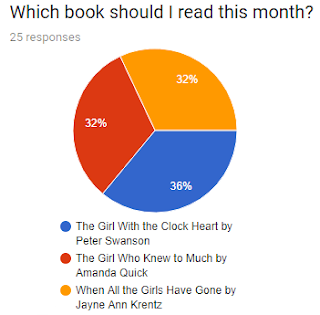 With nine votes to the other two at eight votes each, Peter Swanson's The Girl with a Clock For a Heart wins my August TBR poll. I think that was my closest poll yet! Thank you to all who voted! It just so happens I just finished reading Julia Alvarez's In the Time of the Butterflies and am ready to jump right into Peter Swanson's novel. I voted for that book so I'm glad it won! :) I've enjoyed reading the other two books by Peter Swanson except for this so I can't wait to hear what you'll think of it. Melody - Thank you for voting! I've already started it and am enjoying it so far. It'll be my first by Peter Swanson. Wow, those are really close! Eustacia - It was close! I was practically biting my nails, hoping someone would break the tie. I don't think I voted for this one, but it does sound good! I hope you enjoy! Berls - I would like to read all three of them as they all sound good! Ooh a close one! Looks like a good one won though! Erica - I'm looking forward to this one! Looks like it was a close race between the 3 choices. I am reading a Biography of Ernest Hemingway and some memoirs. It's been ages since I read anything by Hemingway. How are you enjoying the biography about him? I hope you enjoy this one! I just finished Spellbook of the Lost and Found. Carole - I hope I will too. :-) I would like to read Spellbook of the Lost and Found. I hope you liked it! Well that was a close vote! I voted for the book that won, but what strikes me is how incredibly close all of them were in the running! Wendy, do you ever remember that happening before on your blog? Donna Marie - I know I've had close polls before, but I don't think quite that close, especially not right up until the last minute.